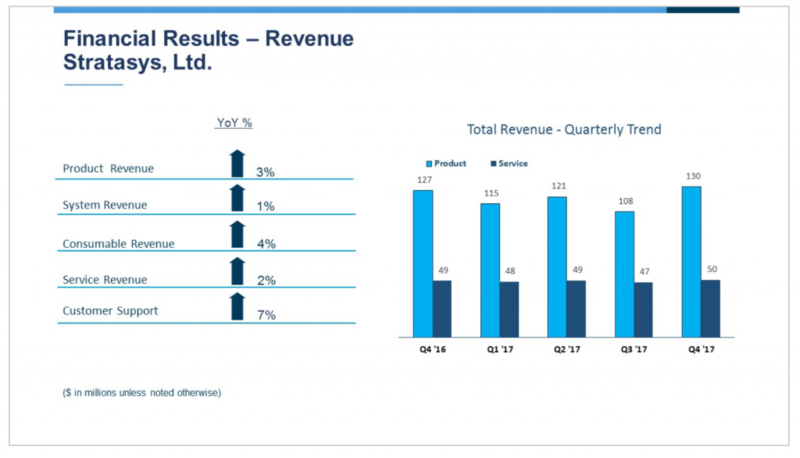 Full year financial results for Stratasys (NASDAQ: SSYS) show a return to growth in 3D printer systems revenue, a large cash balance and an improved bottom line. However, this was not enough for investors and the share price dropped sharply after yesterday’s announcement. Total Q4 revenue increased by 2%, to $179.3 million, compared to $175.3 million for the comparative period. The fourth Quarter GAAP net loss at Stratasys was $10.0 million, $0.19 per diluted share, and non-GAAP net income was $8.4 million, or $0.16 per diluted share. Full year revenue for 2017 was $668.4 million compared to $672.5 million for 2016. This resulted in GAAP net loss of $40.4 million, versus $77.6 million for 2016. Revenue at Stratasys is segmented by Product, Systems, Consumables, Service and Customer Support, with all segments showing growth. Of these, at 7%, Customer Support revenue grew by the largest percentage. Stratasys financial results highlighting revenue for 2017. Although the financial results show improvements in the bottom line and statements form executives provide a clear long-term strategy, the company’s share price took a hit – down almost 20% on the previous day at one point. The share price has now started to recover. A number of factors contributed to fall, perhaps the most significant being the low growth forecast for 2018, with $670 to $700 million in revenue provided as guidance. 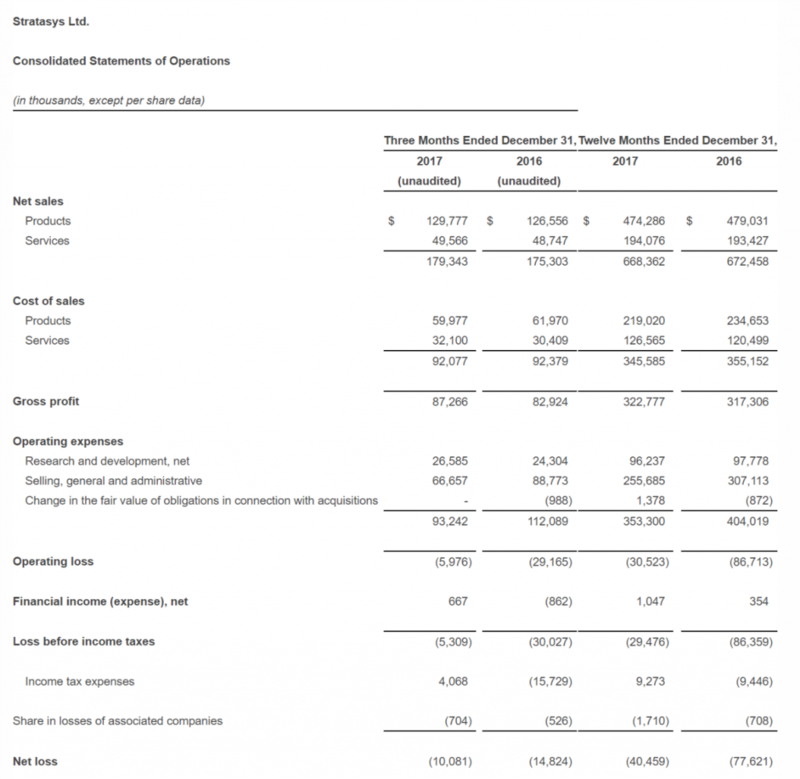 A summary of the financial results for Stratasys can be found at the end of this article. 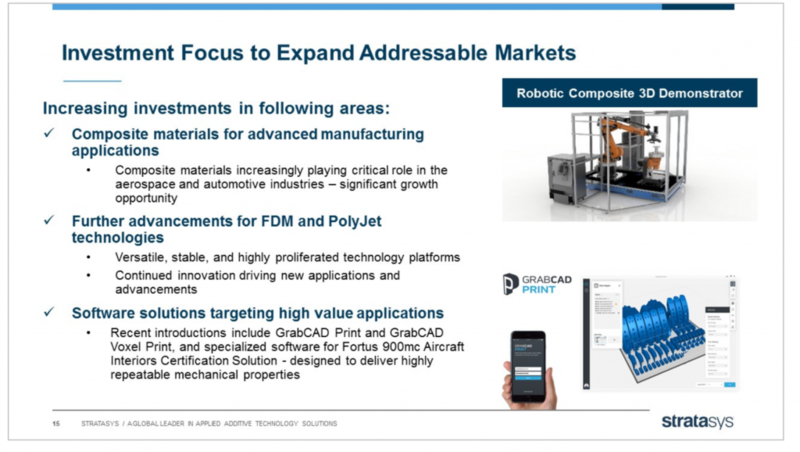 As Stratasys has the largest installed base of industrial 3D printers in the industry, there is an expectation that revenue consumables – such as 3D printing filament – should continue to provide increasing revenue. Stratasys FDM 3D printers are designed to use proprietary materials, that come in cartridges and canisters containing a chip that provides technical data to the printer. While 3rd party filament spools for Stratasys 3D printers are available, for example Triton 3D, using them can have warranty implications. The slow growth forecast may be attributed in part to the long adoption cycle for industrial 3D printing. In high value industries such as medical, aerospace and automotive, internal qualification processes can be lengthy, between 2-4 years at some customers. Once a customer completes qualification, “we see an increase in business. I think over the coming years, we will see more of that,” said Levin. The F123 series of 3D printers was successfully launched in February 2017. The F170, F270 and F370 3D printers are an important revenue driver at Stratasys. Aimed at professional rapid prototyping applications and design workgroups. This product is intended to access an untapped opportunity and will continue to add to revenue during 2018. Stratasys generated $61.9 million in cash from operations during 2017. At year end the company had $328.8 million in cash and cash equivalents, compared to $280.3 million at the end of 2016. While Levin ruled out a share repurchase, the company remains open to “opportunistic acquisition opportunities”. 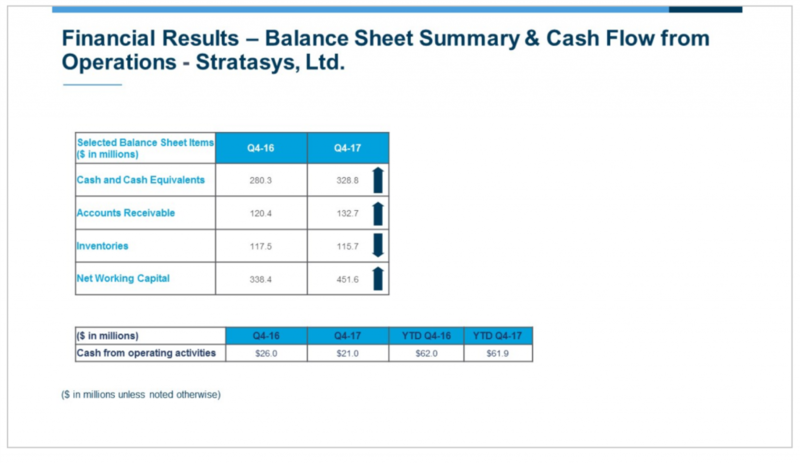 Stratasys balance sheet summary and cash flow from operations. Some of this cash will be used for planned capital expenditure at Stratasys. CapEx, for 2018 will range between $40 million to $50 million. Some of these funds will finance construction projects in Rehovot, specifically the main premises for offices in R&D activities. The R&D activities include the continuing development the Robotic Composite system and Evolve Additive. These activities are not anticipated to generate revenue in 2018. The strategy of the 3D printing company, takes “an increasingly more market segment approach than ever” both on the the go-to-market side, account management, and “a little bit on the development cycle” according to Levin. 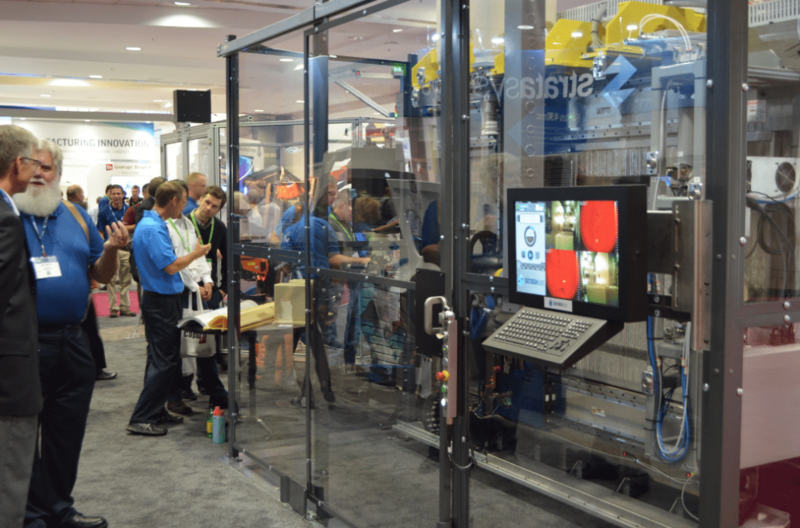 Stratasys gives details on strategy. This approach calls for the application engineers and dedicated account managers, and results in a high level of customer engagement. While this approach to industry verticals does have parallels with that of rival enterprises, including 3D Systems, it should be noted that the strategy taken by Levin’s company is different in certain ways. For example, in a recent interview with 3D Systems CEO Vyomesh Joshi he explained how his company provides 3D printing solutions for “dental labs and clinics of every size”. 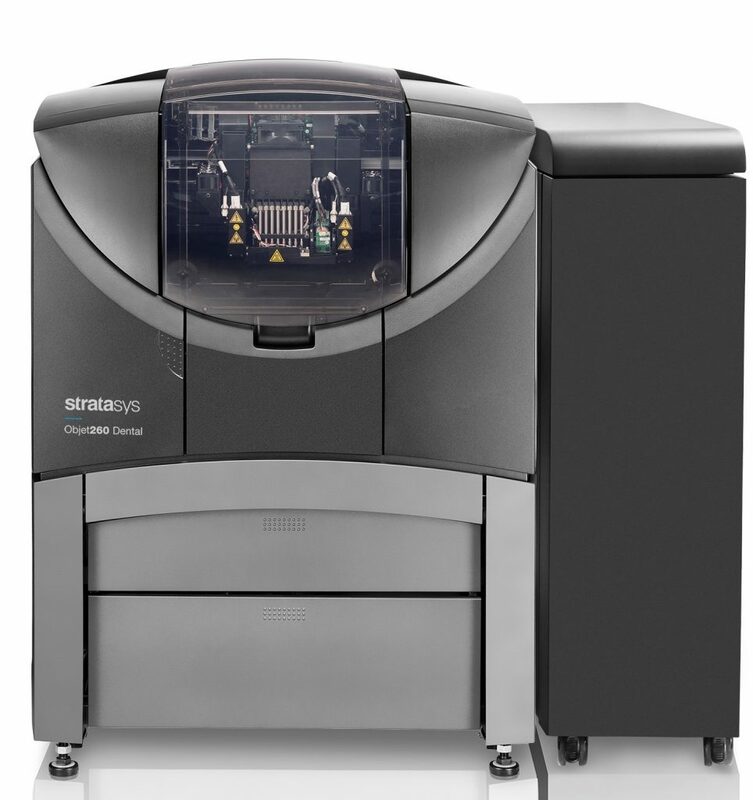 The recently announced Stratasys Objet260 dental 3D printer is another example of, “purposeful innovation” at the company. The Objet260 Dental 3D printer. Photo via Stratasys. Capital expenditures are projected at $40 to $50 million. For all the latest 3D printing financial news and analysis subscribe subscribe to our free newsletter, follow us on Twitter, and like us on Facebook. Protolabs is sponsoring the 2018 3D Printing Industry Awards design competition. Submit your design now to win a 3D printer. Revenue for fiscal 2017 was $668.4 million compared to $672.5 million for fiscal 2016. GAAP operating loss for fiscal 2017 was $30.5 million, compared to a loss of $86.7 million for fiscal 2016. GAAP net loss for fiscal 2017 was $40.0 million, or ($0.75) per diluted share, compared to a loss of $77.2 million, or ($1.48) per diluted share, for fiscal 2016. Non-GAAP net income for fiscal 2017 was $24.2 million, or $0.45 per diluted share, compared to non-GAAP net income of $14.8 million, or $0.28 per diluted share, reported for fiscal 2016. The Company generated $61.9 million in cash from operations in fiscal 2017. Revenue for the fourth quarter of 2017 was $179.3 million, compared to $175.3 million for the same period last year. 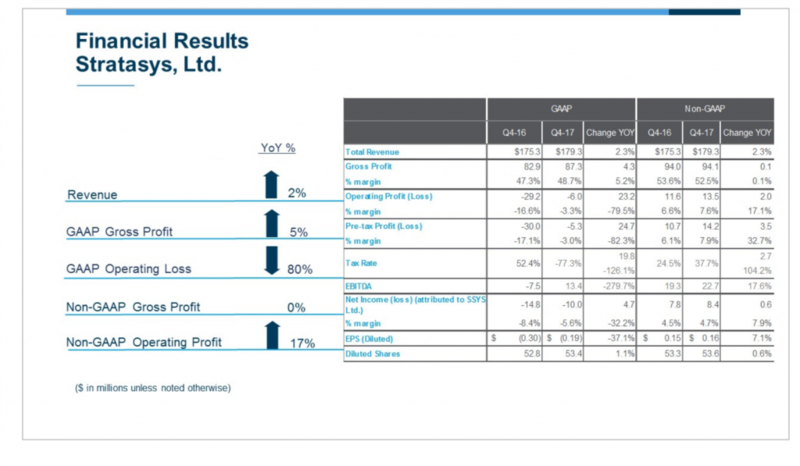 GAAP gross margin was 48.7% for the quarter, compared to a GAAP gross margin of 47.3% for the same period last year. Non-GAAP gross margin was 52.5% for the quarter, compared to 53.6% for the same period last year. GAAP operating loss for the quarter was $6.0 million, compared to a loss of $29.2 million for the same period last year. Non-GAAP operating income for the quarter was $13.5 million, compared to $11.6 million for the same period last year. GAAP net loss for the quarter was $10.0 million, or ($0.19) per diluted share, compared to a loss of $14.8 million, or ($0.30) per diluted share, for the same period last year. Non-GAAP net income for the quarter was $8.4 million, or $0.16 per diluted share, compared to Non-GAAP net income of $7.8 million, or $0.15 per diluted share, reported for the same period last year. Net R&D expenses for the quarter amounted to $26.6 million, representing 14.8% of net revenues. The Company generated $21.0 million in cash from operations during the fourth quarter and ended the period with $328.8 million in cash and cash equivalents. Featured image show Stratasys demonstrating 3D printing applications for McClaren at TCT 2017. Photo by Michael Petch.